Slaying with 200 copies sold. GOW legs still going strong. Love it. GoW and it's amazing legs. I know its low numbers, but I am actually glad to see Dragon's Crown Pro in the Top 40. It's really fun to play online or with other people in general instead of just the AI. Anyone have first week numbers for Heavy Rain or Beyond Two Souls and do we know how Detroit is going to fair next week? Kratos with some great leg(s). Man god of war is doing numbers on uk,very happy with that. Oh. Labo left even the French charts. It was its second biggest market after Japan. 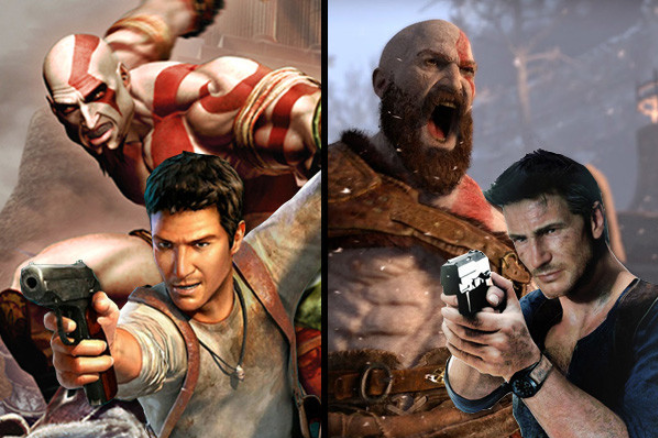 The Uncharted and God of War franchises are actually 2 IPs that grew stronger and larger from PS3 to PS4..
Why does every system on the French website has a top 3 except for Vita that only has a top 2? Only two different Vita games were sold new in a week? You would want it to outsell the other games in the Top 5? I def. would like to see a timeline where Labo is a massive success and outsells all these well reviewed gamer oriented titles on Switch - i have a feeling that many users who are "sad" about it underperforming would go off even more if it was outselling Zelda, odyssey and co. lol. Looks like chart isn't changing. Always knew labo was gonna bomb despite resetera insisting it would set the world on fire. I think that was when it was announced. The predictions since it released have been more measured, and boil down to wait until Xmas. Could go either way yet, i have no idea. To be clear, i'm not the one saying that. FIFA takes top spot next week, world cup update will make certain of it. God of War deserves all the accolades and success, what a game. We don't know that. Well, we will later today when April NPD is released. LOL dude most era members don't know anything about real life market, anything they say you can bet it won't happen or will happen in reverse. They're basically in their bubble where 50 people have the same opinion and somehow they think it translates to the others billions. Can't say i share your confidence. It's competing against several new releases in Dark Souls Remastered, Detroit and State of Decay 2. Curious to see how it'll all shake out. I don't think anyone on this forum should ever gloat about getting a prediction right. Being a part of this community means you've very likely made hilariously wrong predictions yourself in the past. As pleasing as it is to see Labo rightfully (for me) flopping, I actually didn't think it would bomb in every single market. Those are coming out this week? Wow, that does throw a spanner in the works. Why would you want something to flop btw? I personally feel like Labo being a success would put us through another 'wii music/wii fit' kind of era. To be honest, i'd really love to have something on the level of a Wii Sports/Play. Even Wii Fit was fun for what it was trying to do. Even Wii Fit was fun for what it was trying to do. what's wii fit trying to do? From what I recall they just wanted to make a game that made people more active while they were playing and could possibly encourage them to do more extensive exercise outside the game. I played it for a bit and enjoyed it. I actually liked most of Nintendo minigame collection during that generation. They seemed to be the only one that really got it right. So continuing on Özgür chart from last week it should be like this, right? quite impressive. This's likely the last time the game is going to take the 1st spot for a while but 5 weeks is quite impressive. Do you have number for the first 5 weeks for Uncharted 4 and Horizon? FIFA was/is 25€-30€, no surprises. And the World Cup is right around the corner. With the free World Cup update they will sell so many more copies in the next weeks. After reviewing well, I want to see Detroit at the top in few days. Detroit if it sells like HR it'll be on top across the globe. Well, you need strong legs to play football.